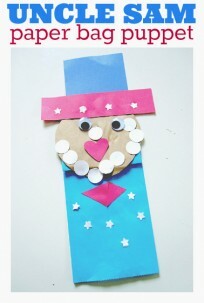 Part of teaching preschool or homeschooling your children is about finding fun new ways to teach the same concepts. Some building blocks for literacy and numeracy really need to be practiced over and over, but that doesn’t mean we need to resort to drill and kill or ( wait for it)… flash cards. 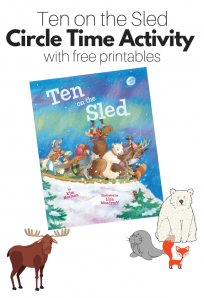 Practicing math facts can be fun and exciting when you are doing it in a new way, and new doesn’t have to be a big change, but using holidays and other special occasions is a wonderful way to make something old new. 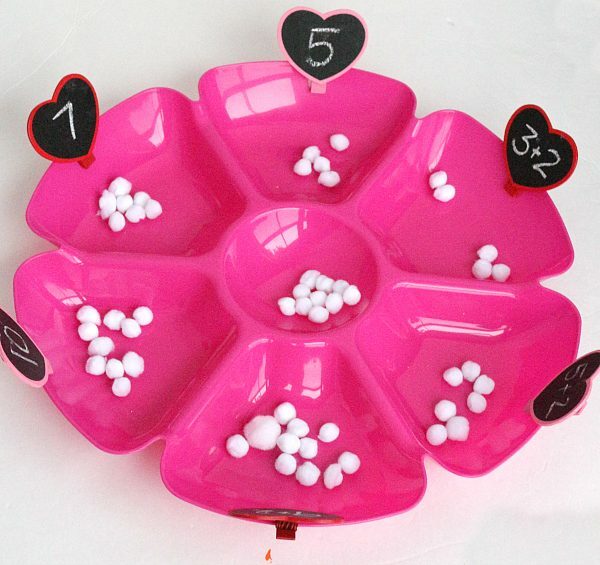 This Valentine’s Day math tray is a perfect example of this. 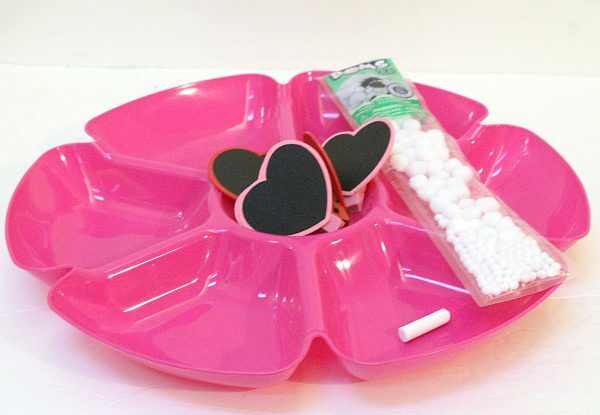 I also love that the heart clips ( found them at Walmart) are chalkboards so I can change it up depending on who is doing the activity. 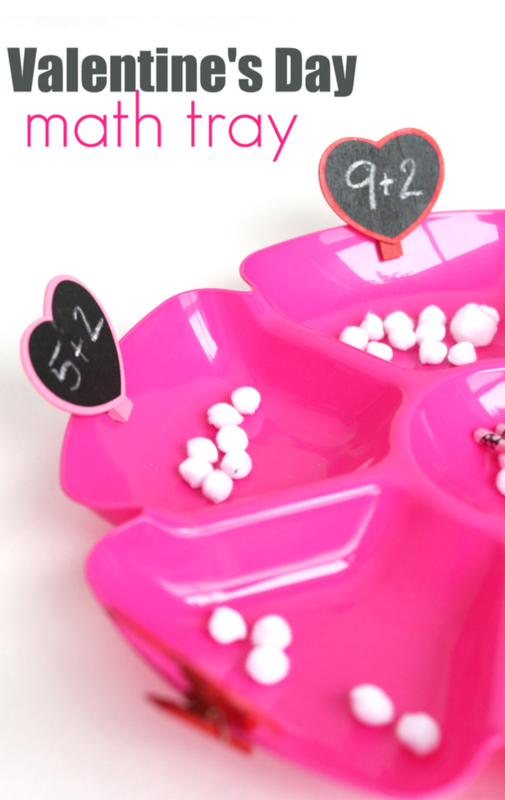 This is perfect for a math station or math center in February. 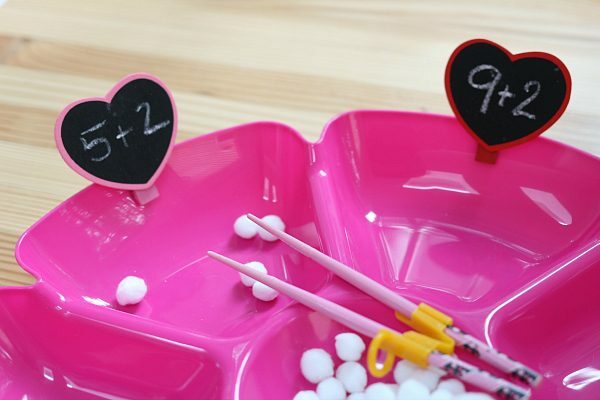 The bonus lesson in this math tray is that children use their fine motor skills to pick up the small pom poms. Gather your materials. 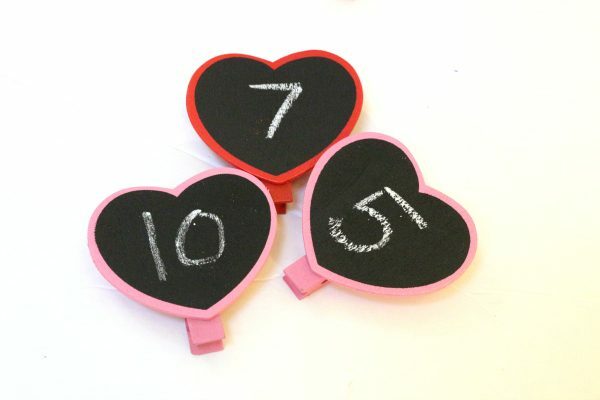 You will need a plastic tray, some pom poms or even plastic hearts, chalk and these little heart chalkboards. Of course, you could also just use a sharpie to write on the plastic like I did for this Lego game. I also added in chopsticks to add a challenge for my 6-year-old. Math isn’t a challenge for her but fine motor skills and patience is. These are completely optional. 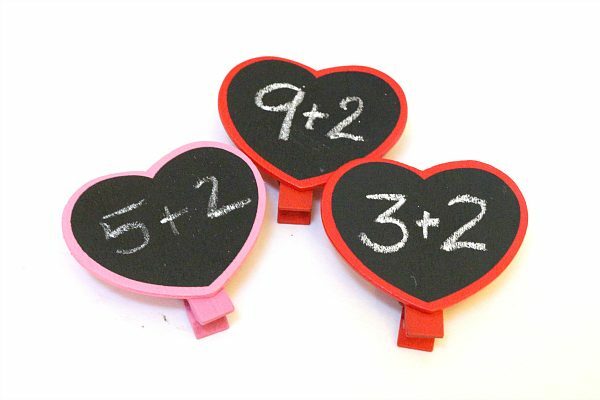 Start by writing on our chalkboards; I did a mix of addition and plain numbers. My daughter did the addition, and a younger friend did the plain numbers. Next, add your pom poms. 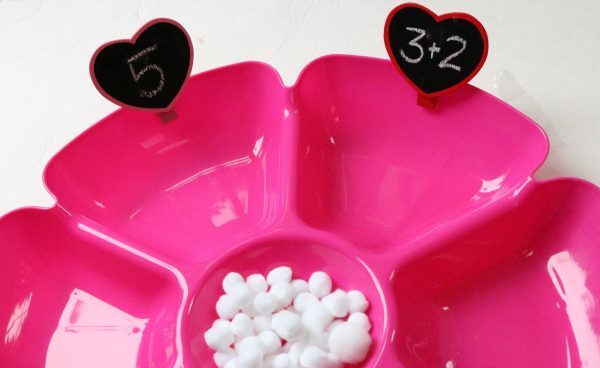 This lets children count or do the addition and then double check by physically touching each pom pom again. 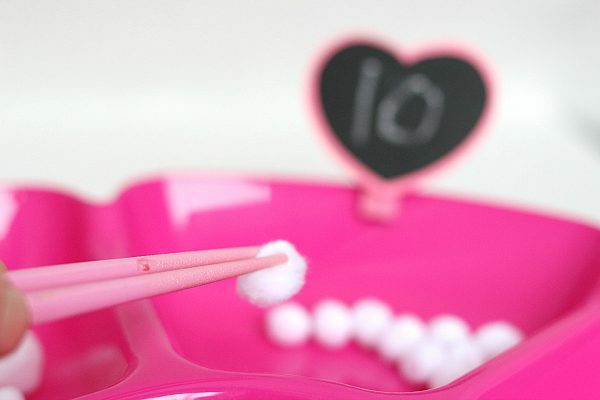 Add in chopsticks for more of a challenge! 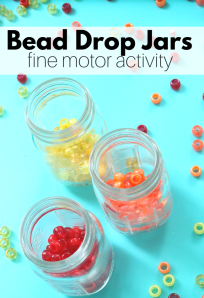 Activities don’t have to be complicated, in fact, the simplest activities are the best. If you put this out during free choice or centers and notice a child using it differently than you intended to stop and talk about it before you correct them. It could be too hard or too easy, and if we chat with them about it, we can find out. 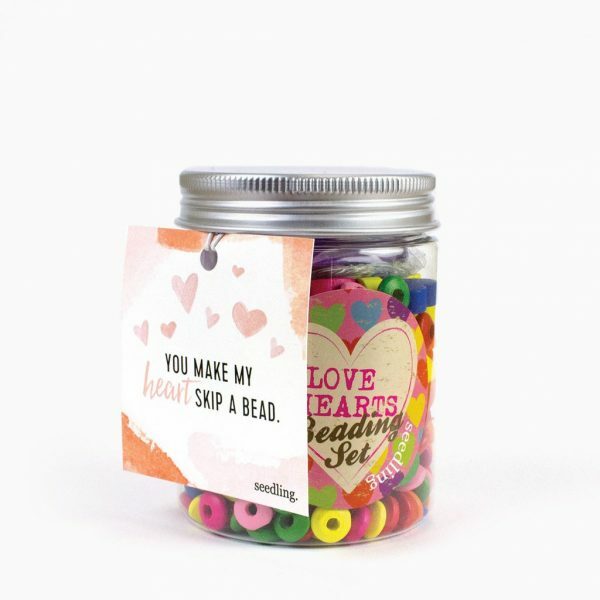 Another fun Valentine’s Day idea is beading and I am asked so often where to get supplies, I get them all over the place, but I found this adorable heart bead set on Seedling that would make a fantastic Valentine’s Day gift that promotes creativity and fine motor skills!